Giving students quick and easy ways to stay healthy in college. When living on or around a college campus, fast food is always an easy option for any meal. While this may be the easiest option, it definitely can be an unhealthy one as well. Fast food restaurants have come a long way in the past few years, and they are making it easier to make healthy choices. The key is knowing what foods to avoid and picking the right ones. Fast food is all about choices. There are a few different things to be aware of when reading a fast food menu and some key words you should look for that will help you make the best choices. Blending convenience and healthiness at a fast food restaurant is possible. When all else fails, pick the chicken – Choosing grilled chicken whenever possible, wherever you are, is always the best choice. Make sure to avoid putting a bunch of unhealthy sauces on it like BBQ and ranch. Also make sure you order it grilled, may fast food places now give you the option of grilled or “crispy” aka – super unhealthy. Beef has more fat, which makes a chicken sandwich healthier than a burger. Another option is to ask for your chicken sandwich without anything on it and put a ketchup or mustard packet on it yourself. Skip the soda – Ordering water with any meal instead of pop takes a handful of calories out of a fast food meal. Choosing juice might seem like a healthy choice, and it is an upgrade from pop, but the amount of sugar in most juices makes it unhealthy. Water is the safest bet. Beware of the salads – Fast food salads can be healthy, but they usually aren’t healthy if you just order them as is. If the dressing comes on the salad, ask for them to put it on the side that way you can add it yourself. Try only adding half the amount they give you, it’s usually enough for the whole salad, and the dressing is the most unhealthy part. As hard as it may be, it sure is the hardest part for me, ask for the salad without cheese. Cheese can add over 100 calories to your meal, so taking it out of the equation is the best choice. Back to basics – We all know that fruits and vegetables are healthier than French fries or onion rings, so why don’t we pick them when we eat fast food? Many places now have fruit cups or apple slices as an option for a side instead of their many unhealthy alternatives. These are obviously the healthier choice, but making that choice is the hard part. If you do choose the unhealthy option, either share them with someone or order the smallest size, usually this is the perfect amount, and it’s cheaper. Under $5 – Go to Subway and get a 6″ sub. They have various sub options that are under 6 grams of fat, just make sure to skip the chips! Under $4 – Most of the salads they have at Wendy’s, McDonalds and other fast food chains are under $4 and are a great healthy choice. Just make sure to look over the tips about salads above. Under $2 – The grilled chicken sandwich at either McDonalds or Wendy’s is under $2, and the best part, these are usually on the dollar menu! McDonalds Grilled Chicken Sandwich only has 10 grams of fat and 230 calories. Under .99 – Every fast food restaurant has a dollar or value menu of some sort, and they usually place the fruit on this menu. It’s a super cheap and healthy option. They also have a dollar or value fry that is usually the smallest size fry they offer and also the cheapest, both of best worlds. 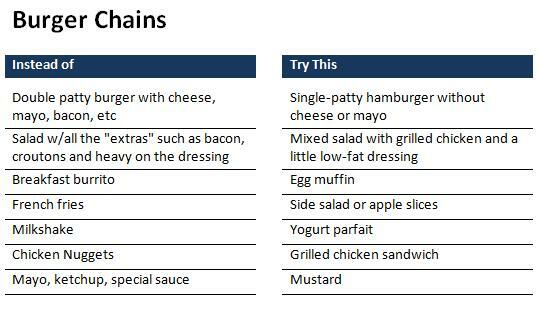 The chart below gives you an idea of what to choose instead of some options you may be choosing now at burger places like Burger King and McDonalds. For an extensive guide that lists the full menu of multiple fast food places and highlights the healthy choices, download the Stop and Go Fast Food Nutrition Guide. This is a helpful guide you can keep in your car for reference. Use these tips to make your fast food experience a little healthier and you’ll be able to have a guilt-free fast food meal. Feel free to check out the perfect smart phone app you can download to help make healthy fast food choices here. What are your favorite healthy choices at fast food restaurants? I really liked this blog post, Erin! it really reminded me to stop ordering McDoubles at McDonalds!! I keep getting them, and I need to pick something healthier. However, I rarely drink pop so I’m doing good there at least. Keep up the good work!